AUTHOR INFORMATION: Before venturing into the field of writing, Karen Azinger spent over twenty years as an international business strategist, eventually becoming a vice-president for one of the world's largest natural resource companies. She's worked on developing the first gem-quality diamond mine in Canada's arctic, on coal seam gas power projects in Australia, and on petroleum projects around the world. Having lived in Australia for eight years she considers it to be her second home. She's also lived in Canada and spent a lot of time in the Canadian arctic. Eight years ago on a hike in the Colombia River Gorge she realized she had enough original ideas to finally write an epic fantasy, resulting in The Silk & Steel Saga. The Steel Queen is her debut novel. Katherine—'The Imp'; a young princess with the stout heart of a warrior will challenge the minions of a thousand-year-old evil. Liandra—The Spider Queen; who uses her beauty to beguile, her spies to foresee, and her gold to control, will need all of her skill and strength to fight a rebellion with her own blood at it's heart. Magda—a silver-haired grandmother who has been stripped of all she holds dear will be underestimated in the fight against a false religion. Cereus—an oracle priestess, will ply her powers of dark magic and seduction in her quest for immortality. Steffan—the puppeteer, will corrupt the innocent and unwary with greed and desire, as he sets fire to an entire kingdom. FORMAT/INFO: The Steel Queen is 437 pages long divided over eighty-six titled chapters. Also includes a map and appendices for the kingdoms of Castlegard, Coronth, Lanverness, Navarre & the order of Kiralynn monks. Narration is in the third-person, mostly via Katherine (The Imp), Liandra the Spider Queen, Blaine the Knight, Princess Jordan, Steffan, Samson the baker’s son, Duncan, and Prince Danly while the minor POVs include the knight marshall Osbourne, Sam the baker, the Mordant, and Sir Cardemir. The Steel Queen is the opening volume of The Silk & Steel Saga, which is projected to be five books long. The second volume is called The Flame Priest. 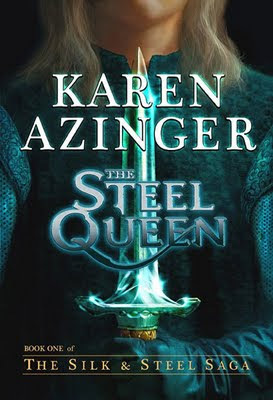 April 15, 2011 marked the Trade Paperback publication of The Steel Queen via Kiralynn Epics—an independent publisher created by the author. The lovely cover art is provided by Greg Bridges. The Steel Queen is set amongst the various kingdoms of Erdhe. Eons ago, the war of the wizards occurred and magic was stripped from the land, although meager remnants are still present in parts of the world, like the Castlegard fortification whose walls have survived unscathed for more than thirty generations and the Isle of Souls. The current kingdoms are mostly at peace with each other, but the Mordant from the north seeks to rule all. As a result, a group of knights took sworn oaths to protect the southern kingdoms, forming the Octagon Knights’ brotherhood with Castlegard serving as their base. Katherine is the only princess of Castlegard and one of the major POVs. She has four older brothers who share her enthusiasm for swordcraft. Unfortunately, Katherine herself is forbidden from learning the way of the sword and has never understood her role as a princess. She is fondly called the ‘Imp’ and yearns to learn from the Octagon Knights who are famed throughout the lands of Erdhe for their valiance, honor and strength. She wishes to pick up the sword and defend her kingdom from its enemies. Blaine is a new knight-in-training who aspires to gain the maroon cloak and become an Octagon Knight. He thinks he deserves the cloak and will do just about everything to make it so. However, he will have to face more than just men in his struggle to rise above his stature. Queen Liandra is the long-ruling queen of Lanverness, one of the richest kingdom in the lands of Erdhe. She faces problems from traitors as well as persecution from the neighboring kingdom who despises Lanverness’ prosperity. Steffan is a poor nobleman’s son who is striving to become more than his title allows for. His willingness to do about anything to gain what he what he desires lures him to the dark side and makes him a major player of chaos. Princess Jordan, one of the ‘J’ siblings of the kingdom of Navarre, is to be apprenticed to a secret order of monks, but finds herself lost in a number of ways in a different land. Samson the baker’s son is a refugee from the land of Coronth, which has been overrun by the Flame religion. Samson is faced with a big traumatic event where he will have to relearn his objectives in life, while also trying to save his country from ruin. Danly is the second prince of the kingdom of Lanverness. Danly feels undervalued and constrained by his status, but he trys his best to achieve what he believes is his right. This includes reclaiming something that was lost years ago. Lastly, Duncan is a master archer who lost his eye to a feud in the past—a past that not many know. Duncan looks upon the “J” siblings of Navarre as his children and tries his best to mould them into fine human beings. His past will come to control his future in more ways than he can imagine. Thus is the table set for The Steel Queen, the opening volume in Karen Azinger’s epic fantasy series, The Silk & Steel Saga. Even though the book features many characters, the author has taken pains to make sure each individual is unique with their own motives and aspirations. Of them all, Liandra was my favorite. Her machinations, lateral thinking and the way she often referred to herself as “we” while speaking to other characters, made her chapters intriguing and I look forward to reading more of her story. I was also impressed with the number of female characters in the book, which resulted in many refreshing role-reversals. On the flipside, because there are so many different POVs, readers might find the book confusing at times, although the appendices do help. Story-wise, The Steel Queen is a very fun, action-packed read in the vein of Stephen Deas and Jennifer Fallon, highlighted by fast pacing, the right amount of background information & exposition, and plot twists galore. Granted, the author has not really created anything new as far as epic fantasy goes, and the story can be a bit predictable because of the inclusion of certain common tropes, but Karen Azinger showcases potential and deft plotting skills in The Steel Queen—which will prove valuable if she is to orchestrate a five book series—while doing her best to keep the reader engrossed in the novel despite its familiar trappings. You are welcome, be glad to hear what you think of it. Not interested, far too many female leads as opposed to male characters. It's as simple as that. I believe you read a lot in SFF field Calibandar but this is a strange reason for your disinterest , I'm not judging but I thought if people skipped the book, it would be due to the genre trappings of the story.